Hizbullah has over 100,000 missiles “ready for launch,” said the deputy commander of Iran’s Islamic Revolutionary Guard Corps (IRGC), who vowed Iran would fight Israel from Lebanese soil. 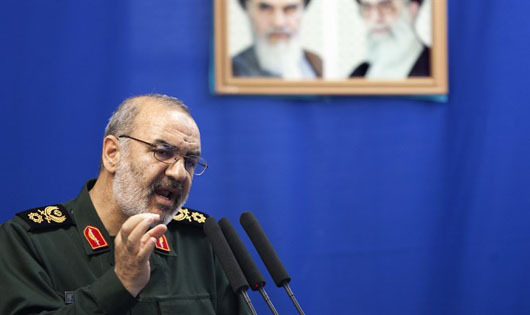 IRGC deputy chief Hossein Salami said the “problem” of the State of Israel’s existence could be solved primarily by using the “mighty power” of Hizbullah, Iran’s terror proxy in Lebanon, the Middle East Media Research Institute (MEMRI) reported. “In addition to the threat to Palestine’s existence, the Zionist regime constitutes a threat as well to the entire Islamic world. That is the philosophy of the establishment of this regime: … [Israel] brings the range of America’s missiles against the Islamic world 12,000 kilometers closer, and becomes a tool for imposing America’s policy against the Islamic world. The “Jerusalem Operation” was Iran’s name for its operation against Iraq during the Iran-Iraq war in the 1980s. Hezbollah “settlers” are reportedly replacing the native Syrian population as part of a conscious plan to change the country’s demographics. Under Iranian direction, the Lebanese Shi’ite terrorist group has been fighting on behalf of Syrian dictator Bashar al-Assad’s regime since the Syrian civil war broke out in 2011. It also dominates southern Lebanon, where it has established a massive terrorist infrastructure in order to threaten Israel. Ayyash attributed this policy directly to Iran, which is Hezbollah’s chief financier and uses the group as a proxy to influence events in Lebanon and Syria. The ambitions of Hezbollah’s settlement project are large, Ayyash noted. “According to the information [we received], Hezbollah is investing in developing thousands of acres in this area, known for its fertile fields, and will directly reap the profits,” he said. A pro-Hezbollah website boasted that in a year, the Iran-backed terror group could have 500,000 rockets, which, according to an expert, would give Hezbollah the ability to “saturate Israel with rockets,”making the next war “nasty,” Adam Kredo reportedWednesday for the Washington Free Beacon. An article at the Dahiya website, a Lebanese pro-Hezbollah site, claimed that Syrian President Bashar al-Assad rejected a request by Russian President Vladimir Putin to remove the 70,000 missiles Iran has deployed across Syria. Assad, according to the article, has ordered his army to build and camouflage missile silos to allow Hezbollah to build its rocket arsenal in Syria alone to reach 500,000. The Trump administration announced Friday that it was slapping fresh sanctions on Hezbollah-linked individuals and businesses in Africa and the Middle East — a move to limit not only the operations of the terrorist group, but also Iran’s influence in the region. The Treasury announced that it is targeting a network of companies and individuals in Lebanon, Sierra Leone, Ghana, Liberia and other countries linked to Hezbollah financier Adham Tabaja. The sanctions freeze assets in the U.S. and prevent Americans from doing business with any of the six individuals and seven companies. The U.S. has designated Hezbollah a terrorist organization that also plays a major political role in Lebanon. Experts say that there is a sense that the administration is attempting to re-invigorate global efforts to push back against Hezbollah, while walking a fine line so it does not destabilize Lebanon. “There is a position by the administration that they want to do it so as not to destabilize Lebanon’s economy and banking sector and do it in a way that targets global aspect of Hezbollah and in a way that minimizes Lebanon’s exposure,” Tony Badran, a research fellow at the Washington-based Foundation for Defense of Democracies and the author of “The Third Lebanon War” told Fox News. The U.S. estimates Iran sends Hezbollah about $700 million a year and officials say that Hezbollah has become Iran’s main proxy in the Arabic-speaking world. The U.S. is particularly concerned about Hezbollah’s presence in Syria and Yemen. Badran warned against making an “artificial” distinction between Hezbollah and Iran, arguing that it is largely an extension of the Iranian Revolutionary Guard. Most of the individuals targeted had not been publicly known to be financiers of Hezbollah, nor are they prominent names in Lebanon. TEL AVIV – Lebanese terror group Hezbollah may use suicide ships in its next war with Israel, R.-Adm. Prof. Shaul Chorev told the Jerusalem Post. “Hezbollah will not need to equip themselves with ships like Israel, but we must assume they will use asymmetric warfare to challenge Israeli technology like land-to-sea missiles or suicide ships like you see in Yemen,” Chorev, a former deputy chief of naval operations, said. Yemen’s Houthi rebels, led by Iran, have deployed suicide bombers in small boats to blow up large Saudi vessels in their fight against a Saudi-led coalition. More than 90% of Israel’s imports arrive by sea, yet, Chorev said, the government and the public are unaware of the extent of the threat posed to maritime targets such as natural gas drilling rigs. The IDF believes Hezbollah is in possession of long-range missiles that can hit the rigs. It is therefore incumbent upon Jerusalem to persuade Washington and Moscow to do everything in their power to stop Iran’s navy from becoming further entrenched in Syria, he said. “The Russians have come into the Middle East taking over from the Americans who have neglected the eastern Mediterranean,” Chorev said.